John Bourne & Co were represented at the National Fruit Show 2018 at Detling Show Ground, Kent. 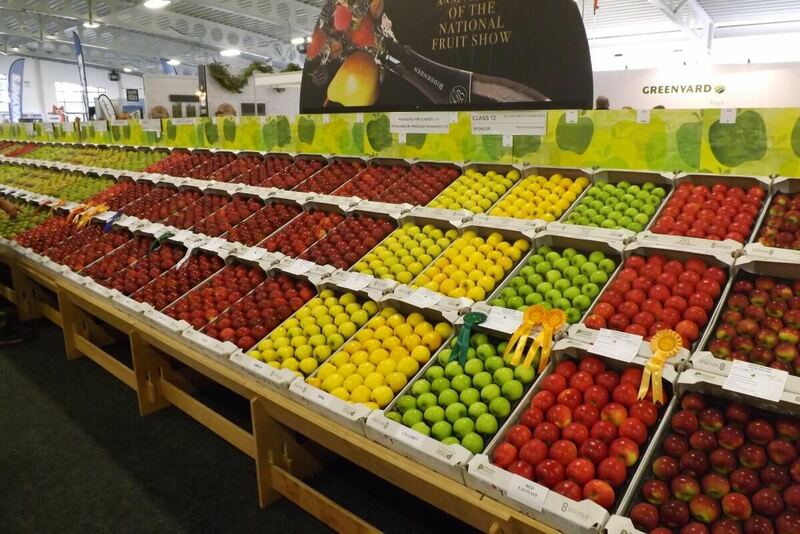 The show presents the best of British produce and technology for fruit growers. There was great attendance over the two days, which allowed us to meet new clients, talk to current clients and discuss opportunities for 2019. The main talking point of the show was the extraordinarily dry year, which in many instances resulted in a large crop of well sized top fruit (apples). For vines, an increase of up to 50% above normal was noted. However, it was made particularly clear by the majority of visitors we talked to, that without compost application, the first-year growth and vigour would have been seriously affected. The excessive heat and lack of moisture during the growing season meant that, without compost, the soils would not have been able to retain the moisture, which would have been a significant detriment to the orchard. Compost application to new orchards is achieved in two ways: (a) spreading down the marked rows before planting, ensuring that the compost falls into the holes with the root when planted. Option (b) is to spread down the rows immediately after planting, which helps with weed suppression, moisture retention and improving the soil structure with organic matter. The increased yield, particularly on the vines, has caused an increased volume of product for pressing. So much so that sites are now using alternative storage options such as IBCs (intermediate bulk containers, typically about 1 cu.m.) and articulated tankers, as there is no extra capacity available. With the increase of smaller vineyards in the UK, this is something that needs more investment moving forward. If you look at the number of new vines planted, 50% of vines planted in the UK have not yet produced a grape. It takes three years for that vine to produce a crop suitable for consumption, so, when these vines start to produce a suitable crop, this will only compound the current problem.